« We Can Do This!!! 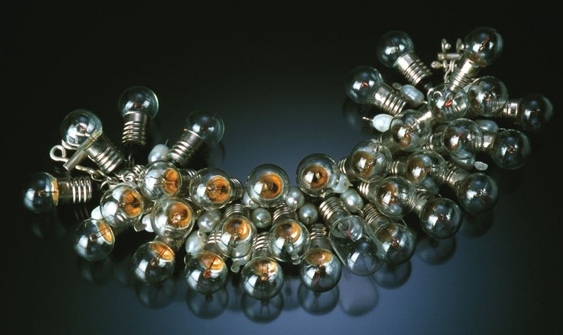 Ken Thibado works spans fine jewelry design to recycling disparate combinations of materials. (The featured bracelet includes, pearls, sterling silver and automotive light bulbs.) “Ken Thibado is an award winning Contemporary Metalsmith and Master Goldsmith. His work has been featured in galleries and museums across the United States, including the Rock and Roll Hall of Fame. Additionally, Ken is the 1st Place Jewelry Artist for the 2008 Art Buzz Collection. Ken Thibado’s work has been published in many books and periodicals. Most recently; Art Jewelry Today 2 from Schiffer Publishing, PMC Decade from Brynmorgen Press, and several Lark Books publications including 500 Brooches, and 500 Earrings. Sorry for the late post today. We are selling our house this spring and we spent most of the weekend de-cluttering.